Very funny! 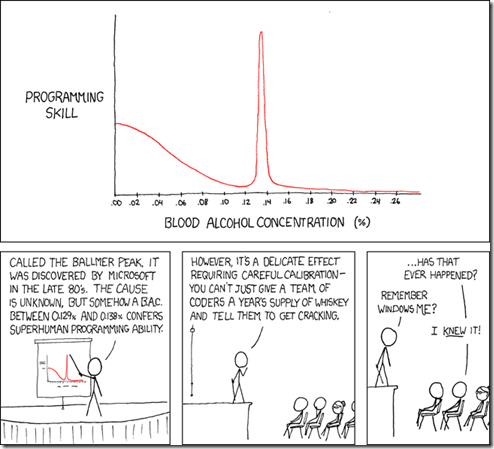 But in my experience, one of the fastest ways to kill programmer productivity is to give them beer. An unsubstantiated rumor posted on a CNN website caused a sharp drop in Apple’s stock price Friday. The early morning report caused Apple shares to plummet to their lowest point in a year. Apple denied the report as soon as they heard about it, and Apple’s stock recovered by the time CNN removed the false report, but Apple stock ended down 3 percent for the day due to the broader market slide. This is part 5 in a series of articles on obscure programming languages. Euphoria was developed to be easier to learn and use than BASIC, but with high-level constructs. Euphoria supports both loose and strict variable typing. Euphoria functions are naturally generic and can operate on any type of data. Euphoria is not object-oriented, yet it achieves many of the benefits of OO languages in a simpler way.